This giveaway is now closed! The winners are Melanie ([email protected]…) and Hannah ([email protected]…)! While I’m not opposed to regular wax candles, I have quite a bit of beeswax in my cabinet and decided to look into making beeswax candles this year. Thankfully, I came across a tutorial at DIY Naturals with Betsy’s tips for beeswax candles, and I love how they turned out! The creamy yellow color of these candles feels warm and natural, and I’m excited to make more of them as gifts this year! I used the palm shortening I had on hand (which actually uses a mixture of palm oil and coconut oil) as well as the wicks I had in my stash (which were no longer in a package or marked with a size) without any problem, but be sure to read Betsy’s tips for selecting a wick size. She also weighs her ingredients, while I measured mine out by volume. And, of course, I added essential oils because I wanted candles that smell like the holidays. In an old jar that you don’t plan to reuse, add beeswax and palm oil shortening. Set the jar inside a pot of water and heat the water over medium heat, stirring the wax and oil with a wooden skewer until it’s melted. Cut your wick to twice the height of your jar. 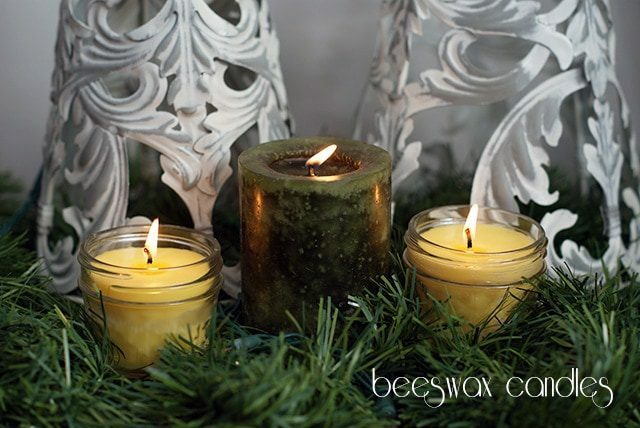 Carefully dip the bottom half of the wick in the melted beeswax mixture and lay flat on a piece of wax paper, stretching it out to lay straight and flat. Turn down the heat on the stove and add essential oil to the wax, stirring to mix. Pour 1/2″ of melted wax in the bottom of the jar. Add the wick, making sure it touches the bottom and holding it straight until the wax hardens. Once the wax is completely hardened in the bottom, rest a wooden skewer on top of the jar and wrap the wick around it securely. This will help hold it in place as you add additional wax. Pour more wax in the jar, leaving room at the top. Set aside to harden. Once the wax has hardened, cut off the extra wick and you’re done! I’ve shared before that the thing I love most about Plant Therapy is that they promote safe, responsible use of essential oils. Essential oils are extremely potent, and while they are all natural, they still come from plants, which means they can still have negative side effects if used improperly. 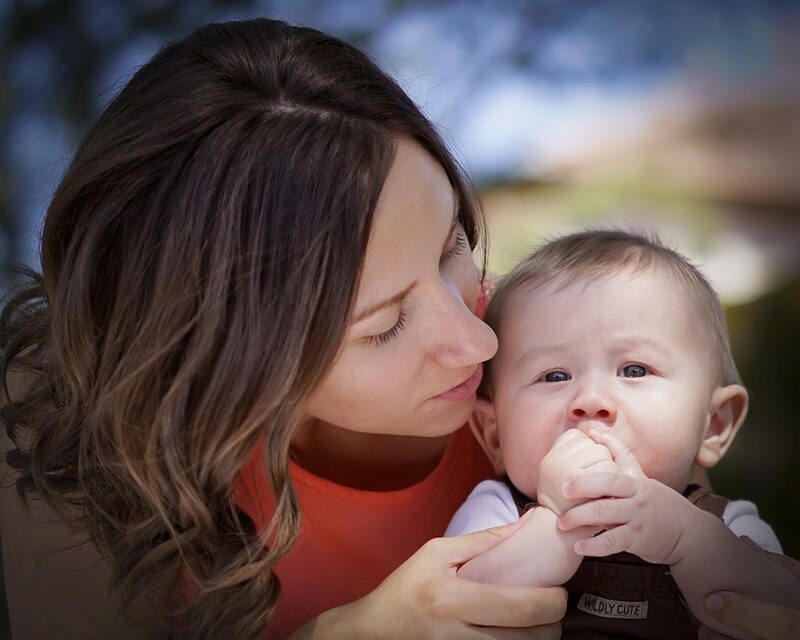 Plant Therapy works closely with Robert Tisserand, a noted aromatherapy expert and author of one of the most comprehensive guides to essential oils, and they recommend extreme caution when using essential oils around babies or children. Despite offering only the highest quality, pure essential oils (as shown through third-party testing), they do not recommend internal use without the supervision of a trained aromatherapist, and they warn against using essential oils undiluted (or neat) because of potential issues with phototoxicity or sensitization. And they host one of the best essential oil Facebook groups around, with almost 25,000 members asking questions, sharing recipes and more. 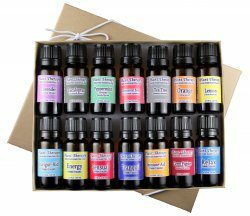 Because they’re awesome, Plant Therapy is giving away two of their 14 Essential Oil Sets this week on Life Your Way! These sets are worth $54.95 each and contain Plant Therapy’s top singles and synergies. Whether you are struggling with holiday stress, need some sleep or simply trying to stay healthy, this set is for you! The giveaway ends at 11:59 p.m. ET on Friday, 11/14. The winner will be selected randomly and notified by email, and this post will be updated with their name as well. Unfortunately, due to the international laws governing sweepstakes and lotteries, we’re only able to offer these giveaways to U.S. residents 18 years and older. I love candles I burn them an hour before my husband gets home. I like him to be well relaxed after a hard day of work. Its amazing how candles can sooth you plus they make the house smell amazing. We have four dogs and when people come over they are always surprised to know we have animals. I love the idea of homemade candles! I just started using essential oils this past summer through Young Living, however, I have also recently discovered Eden’s Garden and Plant Therapy and have started ordering through them as I like their prices a whole lot better and I appreciate their safe practices with the oils. I am making a list of gifts to make for Christmas this year and these candles are going on it!